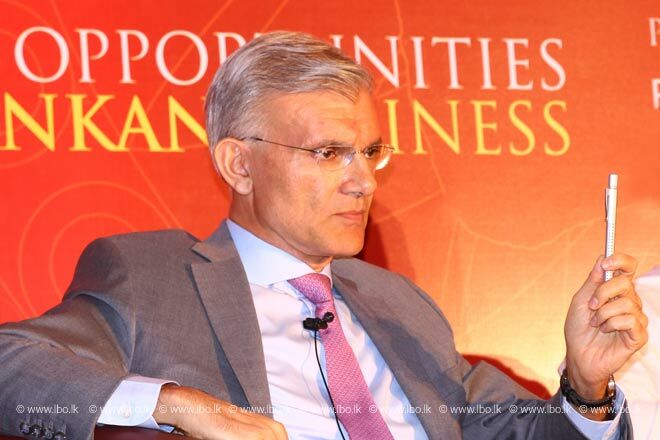 May 21, 2015 (LBO) – Sri Lanka capital markets will have to face a tough time ahead in debt financing through global capital markets, an economist said. Razeen Sally an Associate Professor at the Lee Kuan Yew School of Public Policy, National University of Singapore speaking at the 62nd LBR LBO CEO forum held Wednesday pointed out an increase in the global interest rates. “A probable rise in global interest rates which among other things, raising very worrying questions about debt financing for Sri Lanka from international capital markets,” Professor Sally said. Quoting a paper published by economists Lant Pritchett and Lawrence H. Summers last year, Sally said that a great convergence between the west and the rest would not be expected. “Then for 30 years we saw actually a considerable convergence with the poorer countries catching up faster and narrowing the gap with the west in aggregate.” Sally said. Summers and Pritchett in their paper has argued that the convergence between richer and poorer countries is just the blip on the screen. Sally said that over the last decade there was a boost given by easing money or loose monetary policy as well as high commodity prices for some countries. “But that’s coming to an end. Commodity prices are going in the other direction and easing money is probably coming to an end as well as we see with the beginning of a turnaround in the US monetary policy.” Sally further said.